Get to know Robinson Secondary School! Robinson Secondary School is committed to building an environment where academic, social, and ethical growth is expected and where students share in and accept the responsibility for their learning. The mission of Robinson Secondary School is to create a culture of confidence in which all students are empowered with the academic, social and ethical knowledge and skills to be well-rounded citizens ready for life beyond high school. 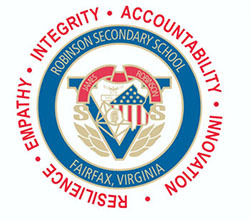 As members of Robinson Secondary School, we value honesty, integrity, and respect for self and others. 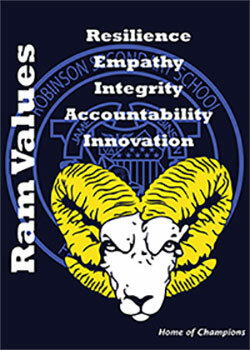 I accept responsibility to uphold these values to preserve my honor and the honor of the Robinson Community. View our High School and Middle School Blue-Gold bell Schedules as well as two-hour delay and early-release bell schedules. James W Robinson lost his life serving in Vietnam. Read his story. Is your address in the RSS boundary?